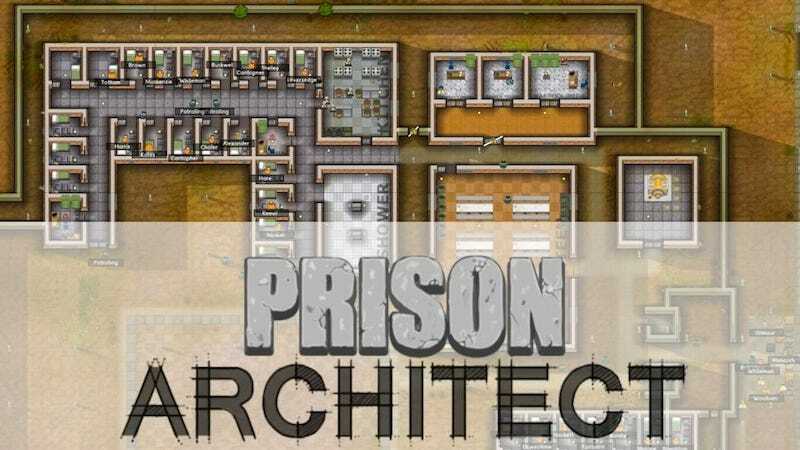 I'm already on-record about how fascinating Prison Architect is. Seriously, it's SimPrison—or ThemePrison, if you will—made by people who seem to be damn near fearless about making video games about uncomfortable topics. Here's our exchange, with answers from the Introversion developers current as of this morning. 1. Large government/industry grants, which pay for big construction projects with objectives like "educate 100 prisoners" or "build a state of the art medical facility". 3. Private industry income from prisoners working on site. You will be able to employ your prisoners to produce trinkets from raw materials—e.g. number plates from sheet metal, which you can then sell for a profit. Pay your prisoners a small wage (which they love because they can then buy basic items from the shop like cigarettes, phone cards etc), and use the profits to expand faster. The only danger is the number of tools your prisoners will undoubtedly need to do the work. This is an upcoming feature planned for alpha 9 or alpha 10. Me: I think that's it, but if you want to also update me on the status of the game, release plans, thoughts on which platforms will or won't accept this, please let me know. Incidentally, in light of you guys dismissing your prospects on iOS, I started wondering if Sony, which seems to really love indies these days, would embrace a game like this. I asked them about Sweatshop [a game blocked by Apple] and couldn't get a straight answer [beyond being told that every developer has to meet certain standards]. I'm curious if you've interacted with the Sony folks at all. Chris & Mark: We are still following the established plan of one alpha approximately every month. This has worked well for us, and gives us enough time to attempt meaty updates every month, but also gives our community new material to play with regularly. Alpha 9 and Alpha 10 are both going to be pretty big updates. Beyond that point, our plans get much more vague.